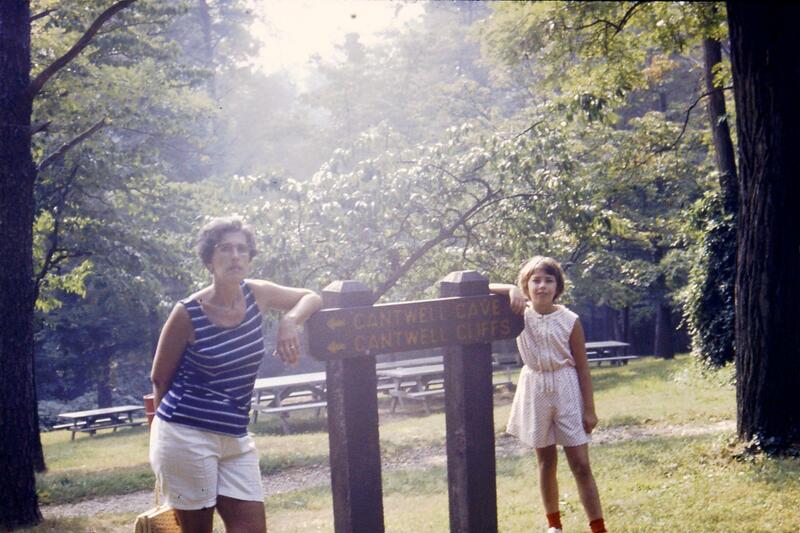 Summer in the mid-1960s (not sure which year). 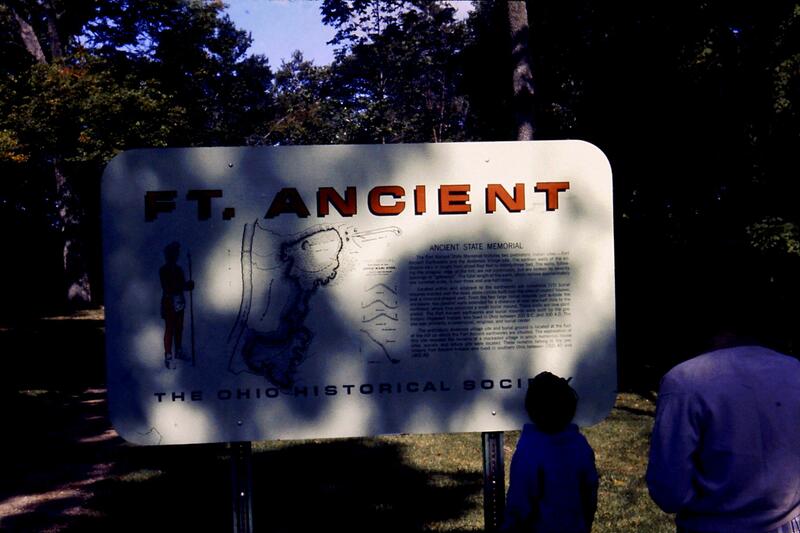 This picture was taken at my paternal aunt’s home in Zanesville, Ohio. 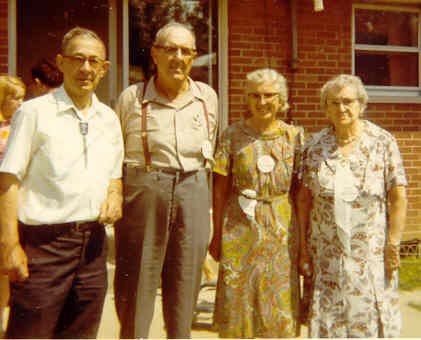 Pictured left to right: my 1st cousin, June (my dad’s oldest sister’s daughter), my Aunt Eva and Uncle Bervil (my dad’s brother), my Aunt Gertrude (Dad’s oldest sister), Eric (June’s grandson), and me. Notice the span of ages between my first cousin – who has a grandchild a little younger than me – and me! I haven’t seen June or Eric since the real early 1970’s. 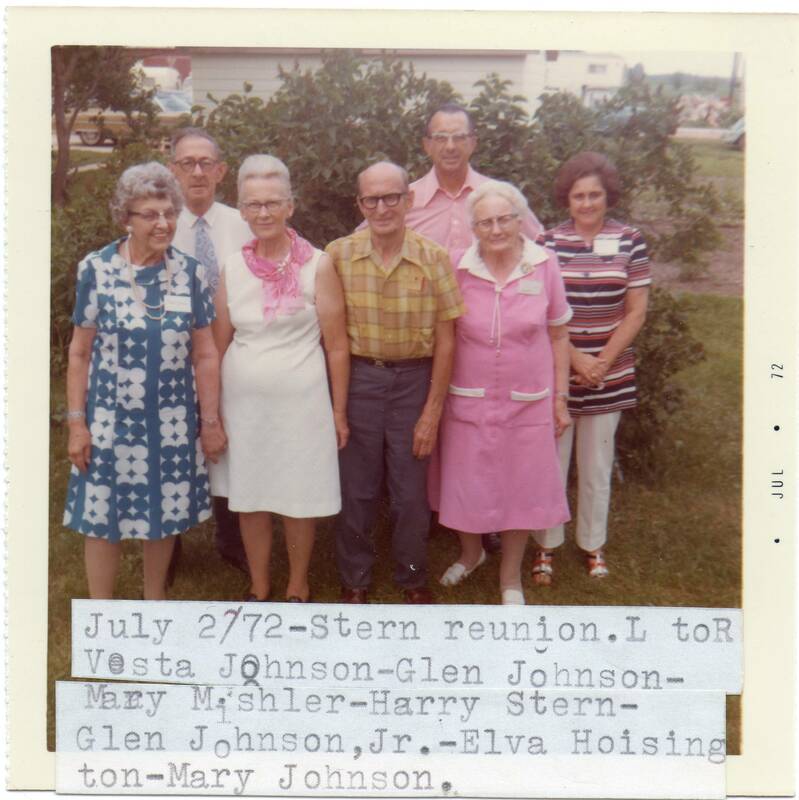 The last time I saw my Aunt Gertie was in the summer of 1972. 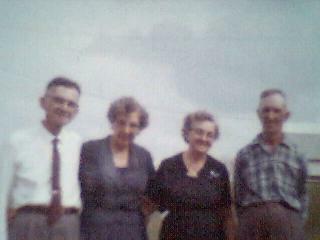 I saw my Uncle Bervil and Aunt Eva for the last time in the late 1960’s. Luckily, I am now in touch with their son, grandson’s, great-granddaughter’s, and their daughter. I’m a day late with Saturday Night Genealogy Fun that Randy Seaver of Genea-Musings posted last night. The challenge was to list the number of descendents of one of the four sets of great-grandparents, how many are living or deceased, and how many we’ve met. 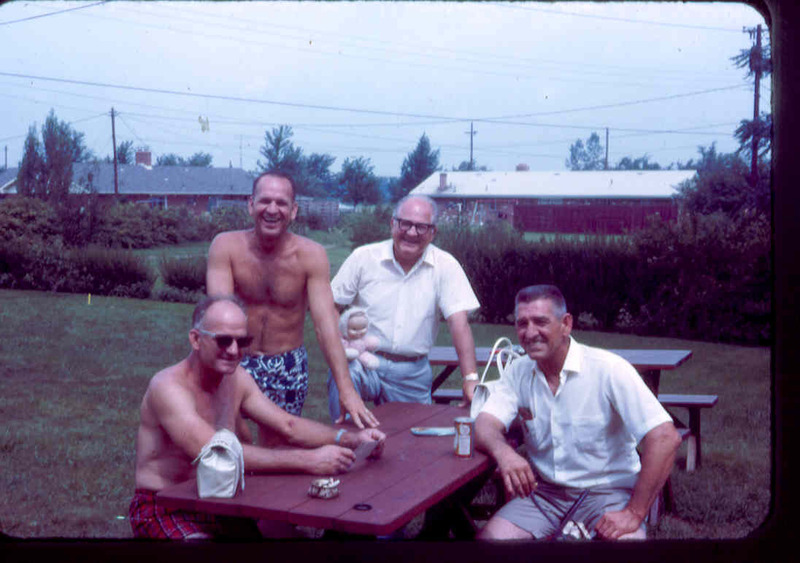 Five of the children (my grandfather’s four brothers) – Clarence, Roy, Zade, Rollo, & Bert. My grandfather and his sister were both deceased by the time I was born. 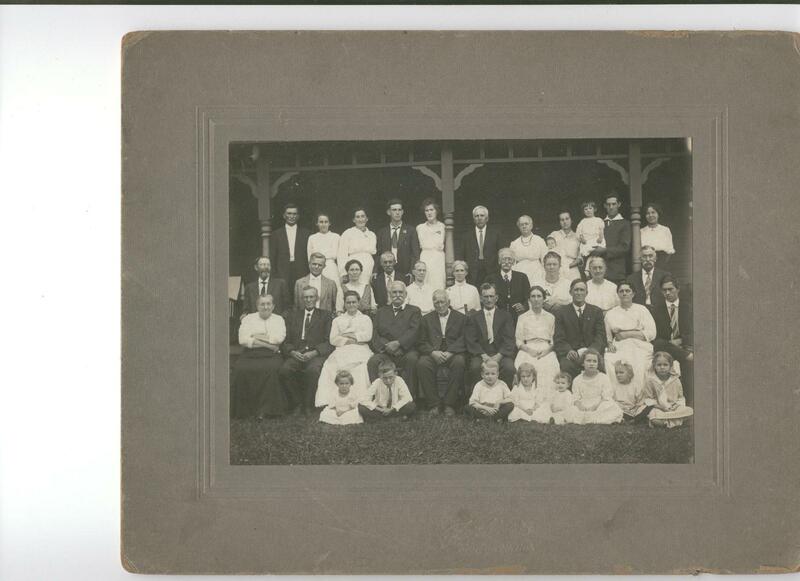 Some of the children of my grandfather’s siblings and their grandchildren – but I was young so I don’t remember names. 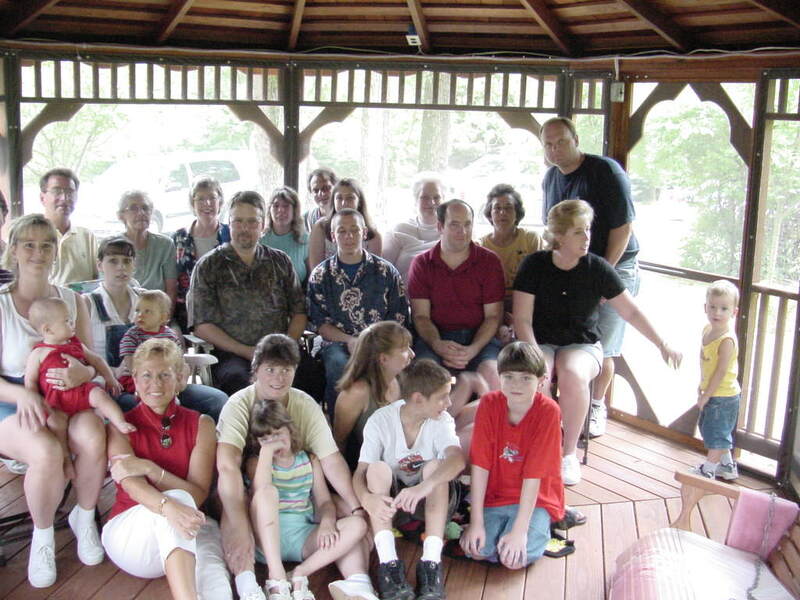 Almost all of my grandfather’s descendents – my dad’s siblings and their children (my first cousins) – who due to the wide age range – are much older than me. Some of my first cousins’ grandchildren I’ve never met. I’ve had the good fortune to meet one 1st cousin I didn’t know I had a couple of years ago and continue to correspond with her via Facebook and email. Some of the distant Amore relatives have also contacted me via email or by phone after receiving a query letter from me several years ago. I feel very blessed that we continue our familial relationship even if it is through email or Facebook. This time of year families migrate back together from either distant areas of the country or through forgiveness and hope for the coming year. 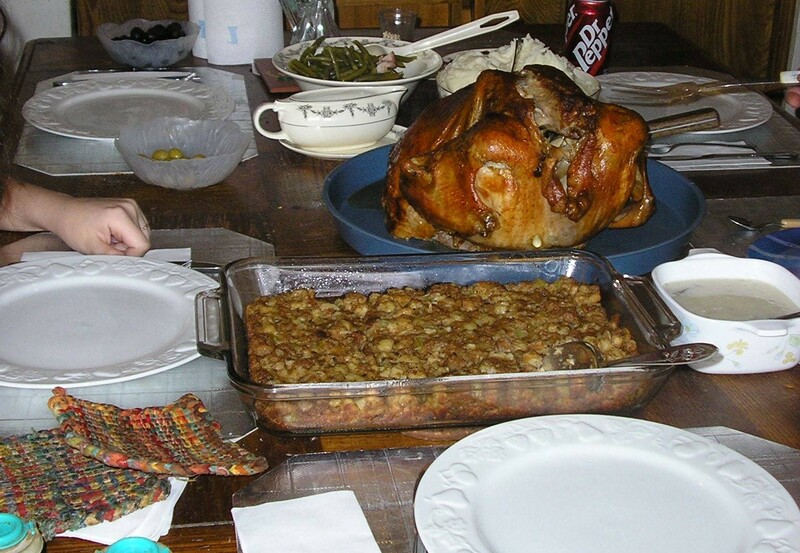 There are many who spend Thanksgiving alone either by choice or circumstance. With our technology even those who are alone or too far away from loved ones, can now spend a portion of their holiday feeling not so out of touch. You can call long distance without worrying about the extra charges – thanks to “all-in-one” phone service or cell phones with unlimited long distance built into the cost of your monthly bill. You can talk via the computer and web-cam so Grandma and Grandpa can actually see the grandchildren telling them Happy Thanksgiving. Or spend time instant messaging one another before the Turkey or during the game. Abraham Lincoln was one smart man to enact legislation making Thanksgiving a national holiday in 1863 while the Civil War was raging. He proclaimed the last Thursday of November “as a day of Thanksgiving and Praise to our beneficent Father who dwelleth in the Heavens.” And for 145 years we have done just that. Thanks, Mr. President. 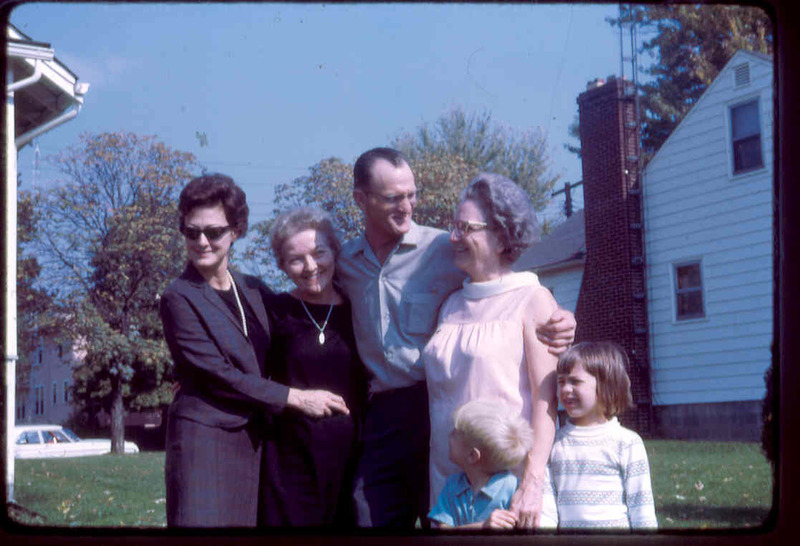 From my earliest memories, there has always been family around at Thanksgiving. As a young girl, we’d spend the holiday at our home with grandparents and in-laws swooping in, eating, enjoying company and staying all day. As an adult I continued the Thanksgiving Turkey and Dressing tradition with my own children. 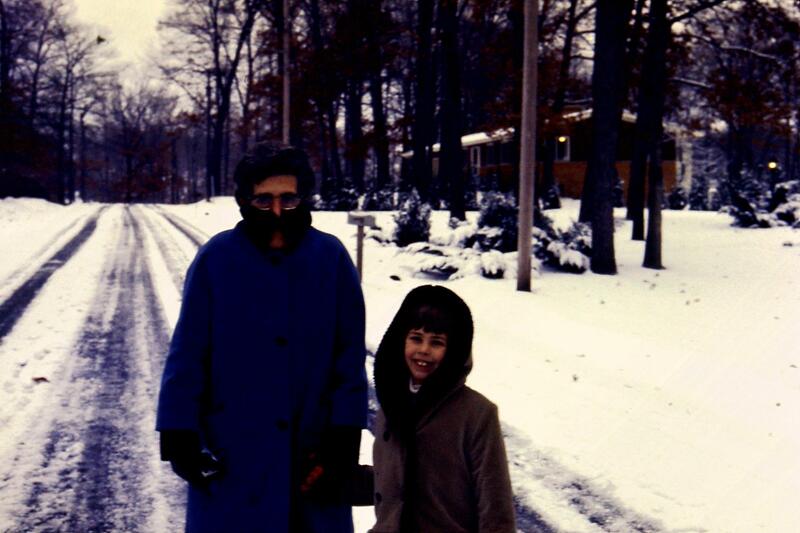 At times we would travel to Missouri to spend the holiday at my in-laws or they would travel to our home in Texas. As the children grew older and became close with other people, their friends would eat at least one of the Thanksgiving meals at our home. We’ve invited families who needed a change of scenery to our house to celebrate and give thanks with us. Ours is always a bountiful day full of family, food, noise, and (of course) the Cowboy game! This year we have all four of our adult children home (two who live here, one who lives close by and one who traveled in from out of state), our three grandsons will be here, our son-in-law, and a possible new addition to the family. We’ll have turkey and all the trimmings along with four different pies and plenty of wine and spirits. And of course we’ll be watching the annual Macy’s Thanksgiving Day Parade, the Dog Show and that at 3:30 p.m. Central Time, we’ll have the Cowboy/Seahawk game playing. Through the newly found family members, I’ve also learned a bit more and was able to share what I’ve learned with them. My experience has taught me that even though I enjoy the research and new information genealogy brings, I also need to focus on the family that is still providing history and stories for future generations. Blink and it might be too late. May you and yours have a blessed Thanksgiving and time with loved ones!